We have moved The Situated Urban Political Ecology Collective to it’s own official website. The Collective grew from 2013 with support from the two Formas-funded projects WOK-UE and MOVE and from 2105 it’s website was hosted here. The SituatedEcologies website that you are reading from now, will continue in its present form. It hosts the The Situated Ecologies Platform, which is developing similar themes as the Collective but being less tied to cities and urbanisation, and with more emphasis on inter- and transdisciplinary collaborations between the arts, humanities and design, alongside explicit collaborations with the ecological sciences. The Platform is a curious space. We draw upon findings in natural and social scientific findings, alongside work in the humanities. We draw upon critical theory related to ontological and epistemological politics; science-and-technology studies (STS); on bio-semiotics and material semiotics; and on interpretative and experimental work in history, theatre and film. We work to create engaging outputs in the form of film, design or theatre, something we see as integral to the research we are doing. We view the Platform as part of the growing and vibrant field of the Environmental Humanities and we contribute to and we have a partner in the KTH Environmental Humanities Laboratory. 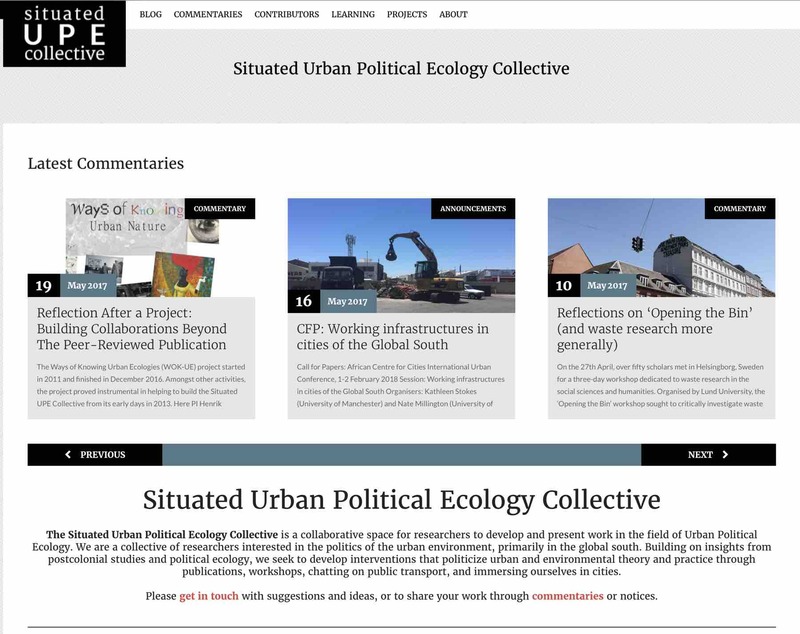 The new official website of The Situated Urban Political Ecology Collective, #SituatedUPE, started in 2017 after having been hosted here since 2015.